Fumigation as a means of grain disinfestations has its serious limitations. It can leave residues in the food grains that are toxic to humans. Also it is not eco-friendly as fumigants mostly used are ozone depleting substances and are going to be phased out. Therefore, heat/ thermal disinfestations of food grains can be a simple alternative. 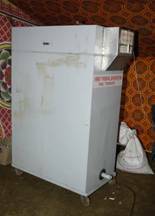 Vibro-thermal disinfestor (VTD) is a simple electricity operated device for disinfestations of food grains. Insect infestation i.e. proliferation of insects on stored grains and pulses is a major cause of concern. It causes enormous losses in quantity and degrades the quality of food grains. There is kernel damage, webbing, adding off odours etc. due to infestation. Further, nutritive value of infested grain is adversely affected. The consumption of infested foods has adverse effects on health such as digestive and pulmonary disorders. Insect infestation jeopardizes export and countries may suffer huge economic losses. Insects in all their development stage are susceptible to killing by heat when exposed to temperatures of 55 to 600C for 30 mins. Examples exist where fluidized-bed heating and solar heat are in use for disinfestation on a commercial scale in Australia. BARC has also designed, fabricated and tested a vibro-thermal disinfestor for insect disinfestation of food grains to achieve a shelf life extension upto one year. The system is amenable for scale up and is mobile. The treatment has no effect on germination of seeds as well. The system is simple, can be fabricated without much capital investment and useful for farmers, merchants and exporters of food grains. Electric consumption is 1 kWh. The unit has been designed in such a way so that it can be fabricated in any workshop with welding, cutting facilities and carpentry shop. It can be operated by one person. Retail Marketings, Public Distribution (Food) department, Mandis, APMC etc.